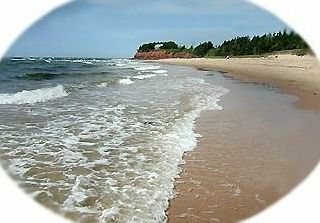 A beachfront vacation rental property on Prince Edward Island, Robertson’s on the Beach provides executive accommodation and privacy highlighted by ocean vistas and private beachfront. Open year round, each level and every room at Robertson’s on the Beach offers a spectacular ocean view. Our beach house features three floors of luxury living detailed with fireplaces, balconies, a spacious soaking tub, and a lookout/study with a stunning ocean view. Our secluded sandy beach edged by rolling dunes gives our guests much sought-after privacy. Located close to world-class golf courses, internationally renowned P.E.I. Lobster Dinners, and the home of Anne of Green Gables, visit Robertson’s on the Beach and see for yourself why this executive beach house has been featured on the Fine Living Television Network’s “Around the World in 80 Homes”. You can also hear it from our guests themselves; below are the comments that Nigel and Heather, visitors from Montreal, added to our guest book. Wireless internet, Beach towels, Beach Lounges, Beach toys, Tree house, hammock, Outside shower. Perfect Home away from Home!!! Stayed with a few friends for a fishing trip. The house is absolutely immaculate! Beautiful ocean front views and the house is extremely clean. Gorgeous hardwood floors throughout the house and a nice big living room and good kitchen. The back deck has chairs for relaxing in the afternoon and there's a big screened-in gazebo in the yard which is great for grilling our relaxing. The house is located just outside Souris and there's a few nice restaurants close by if you don't feel like cooking. You also have access to walk down the beach to relax. I highly recommend this place to stay and the owners are wonderful and very accommodating people! We already booked for next season! This property exceeded our expectations! It is a gorgeous house with all the amenities you could possibly want (e.g., gorgeously decorated with stunning views of the ocean from almost every room, outdoor screened dining area for grilling, outdoor shower, fluffy towels, kids toys and entertainment area, private library upstairs from the mater bedroom that was a perfect hideaway for alone time, etc.). The house is located in Souris which is close enough to a small town for shopping and a few restaurants, but far enough to really feel like you are getting-away and relaxing. Further, the house is on a beautiful, private, whistling sand beach that is a short walk away (2 minutes). We have a 4 year old daughter, who spent hours on the beach which was uncrowned and pristine. We loved it so much we already booked a week for next summer. Lastly but not least, the owners have a keen attention to detail and were attentive and welcoming. I cannot say enough about this gorgeous property and area of PEI. If you want a change of pace, a chance to wind down this is it. The Robertson's have lovely beach house that is well equipped and spacious. Even for six, there are many spots in the house to have your own space. The location is perfect, overlooking a quiet beach. I could swim several kilometers each day in perfect water. The screened gazebo for dining is delightful in the evening and nothing can compare to falling asleep to the sound of the waves and and an ocean breeze. For readers the house has an extensive library and the 'cherry on the cake' is the reading area at the top of the house with a panoramic view of the bay. Our family ranging from ages 2-60's enjoyed every minute of this beautiful place. From "the singing sands" to quiet moments we relaxed. Everything was at our fingertips and every need anticipated. We wished we could have stayed longer. Laura and her husband made it just right. We did some activities in the area and savored being together and all the beauty that surrounded us. It was PEI hospitality at its finest. Our family (including 3 small children) stayed at this beautiful beach house beginning at the very end of June/first of July and we were thoroughly impressed by the cleanliness, spaciousness, and comfort of this home. The pictures don't do it justice. Stunning ocean views from the upper level. Amazing ocean breeze. Beach is a 3 minute walk down a woods path located right by the driveway of the house (very well maintained path, although there is a steep hill, but we enjoyed the extra exercise!). The road to the beach house is also better maintained than some others we have found around the island. Stunning, very quiet beach. Beach chairs located on the beach for cottages use, beach toys in the house shed. The house is equipped with everything you could need. No detail has been overlooked. We have stayed at 4 beach houses in PEI, and this was a favourite for sure. We couldn't have enjoyed our stay more. The Robertson's have thought of every detail to make you feel at home in this spacious and extremely well thought out home. From the fully equipped kitchen to the beach chairs waiting for you on the secluded beach, everything you need is there. Perfect for truly winding down. Listen to the surf at night sooth you to sleep, or read a book from their huge library in the wonderful loft at the top where you see the ocean for miles. If there was a star rating higher than excellent - this property would deserve it.